There are no comments for Snorkeling In Polynesia. Click here to post the first comment. 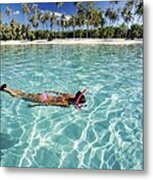 French Polynesia, Moorea, Woman free diving in turquoise ocean.